Here's Part 2 of a rather long (10-mile) hike on the Isle of Skye. If you haven't seen it yet, check out Part 1 for background and the first half of the hike. This is the thing we would be going up and over. It was really a trek. Another waterfall along the way. The path is visible in the foreground (and a little in the distance—that green strip above the gray gravel). You'll note that even a lamb here doesn't seem perturbed by humans. On the ridge, the path was on a steep angle. On the really steep bits, I stopped taking pictures for fear of falling off. Looking back, we see Loch Eishort as the sky begins to brighten up. I came across this stone face (right). It even has a sort of eye. Continuing, we began to see mountains in the distance. The path was muddy (and sometimes turned into a small stream), so we often tried to walk to one side of the path. This is where we found the real mud. The ruined village of Suisnish has been fenced in, so we couldn't get close. There's a sheep barn down there, so we had to walk up the mountain a bit and skirt around it. Suisnish is similar to Boreraig, also cleared by force. Evidence of long stone walls in Suisnish, from a distance. At about this point in the hike (perhaps six or seven miles in, and many hours), the sky over Skye began to do this. I was very fond of these sheep. I'm not sure they cared about me one bit. At this point, the path became considerably wider. Although it was still rocky, it was a marked change from the sheep trails we had spent so much time on earlier in the day. Our pace picked up. I couldn't stop taking pictures of cloud formations. A fellow drove by in an all-terrain vehicle with his sheep dog. His wife also passed us, with several similar sheep dogs. They waved, we waved, and we realized that they must run the sheep barn back in Suisnish. Rochelle ahead of me on the trail. At this point, the road actually had asphalt. We walked even faster, as we were running out of water and still had a few miles to go. This is a modern quarry, though at the time we were convinced it was the lair of a movie supervillain. These sheep gave us the evil eye. This poor guy had a half-coat of wool. He looked self-conscious. And then this began to happen. About a mile from the end of the trip (back at the ruined church), "golden hour" began. This is when the sun begins to set and casts beautiful light over things. Despite being tired and wrung-out from a day of hiking (and not quite enough water), I had to take pictures of Loch Cill Chriosd. The water was calm, and reeds grew in much of it. The mirror effect of the loch is brilliant. I had to pinch myself that this is what the place looked like. It was otherworldly. Here's one spot where the reeds became very thick. 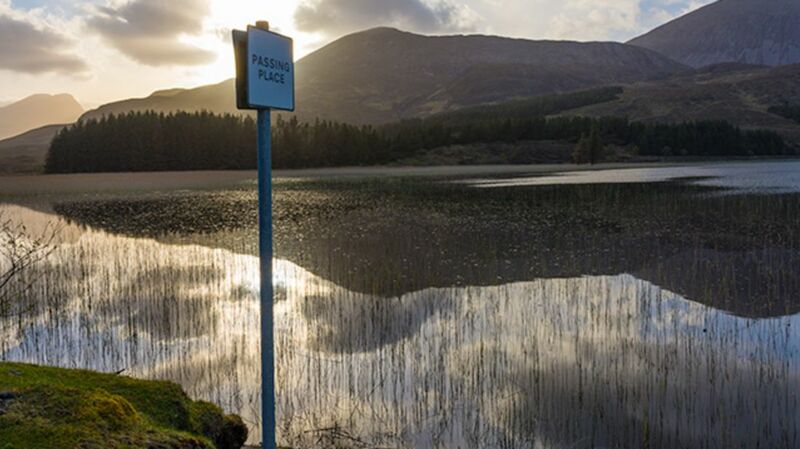 This stuck out as a favorite—a typical Scotland "Passing Place" sign (for single-track roads), in just the right spot. And thus we returned to Cill Chriosd, where the journey began. Another view of Cill Chriosd, now with a blue sky. One our drive back to a rented cottage, we were briefly delayed by these furry friends. It was worth it.